The door slam caught my 10-year-old’s poor big toe, which suddenly made his shoulda’ made it through the summer sandals a non-option. The Keen sandals scored as hand-me-downs were suddenly painful to put on. Spontaneously finding used shoes for a 10-year-old boy is no easy task. Most of the time they look like they’ve been worn by some crazed toe-dragging Sasquatch wannabee. Don’t get me wrong. I am fully committed to finding like-new used shoes for my family. But it usually takes some lead time. But even The Non-Consumer Advocate is not going to make her beloved son wear shoes that hurt and get in the way of healing. I decided to indulge just one teeny stop at Goodwill to try out my used Croc-buying luck. I found a pair of perfectly good, hardly used pair of Crocs in his size for just a buck ninety-nine. 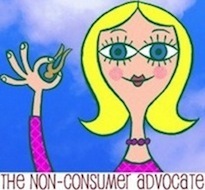 The Non-Consumer Advocate is on fire! I am firm believer in responsible purchasing. Every thing that gets bought creates a vacuum for another thing to be manufactured. I don’t want to be personally responsible for unnecessary manufacturing. So now I can relax in my Compacty-ness, safe in the knowledge that my buy nothing new stance is safe for one more day. Now if I could just get that Sasquatch fellow to stop dragging his feet. Want to know more about the relationship between consumer demand and responsible manufacturing practices? Watch Annie Leonard’s Story of Stuff video. It’s super entertaining and informative too! 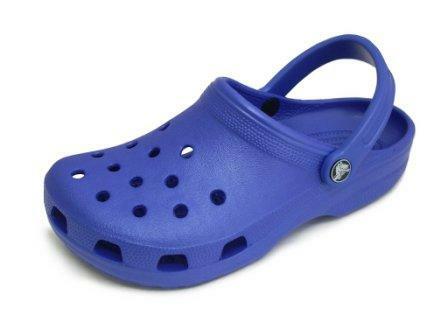 You can also recycle worn crocs when the time comes. This year Crocs started a program called Soles United that takes old Crocs, shreds the rubber and makes it into new shoes that are shipped to needy people around the globe. For more information on the Soles United program, visit http://www.solesunited.org. Well done. I personally haven’t joined The Compact yet – but I’m getting there. Just wanted to say thanks for the Story of Stuff link, I watched it a couple of days ago and now it’s going to be a centre piece for an upcoming Sustainability Awareness Campaign I’m running for my Local Council (local government).